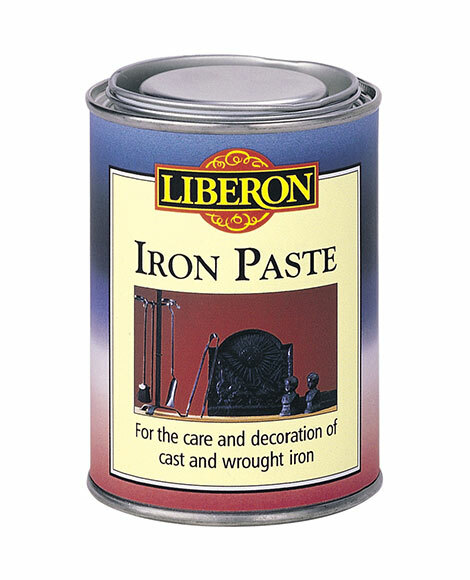 Iron Paste is a black graphite paste used to protect and decorate cast and wrought ironwork. producing a silver or black look, it does not flake off, and is suitable for home decorating. Especially suited to ornamental ironwork, cast iron grates, and fire irons, it is ideal for use when renovating cast iron fire places and surrounds. Reducing the possibility of rusting, it bakes itself onto the surface, and can be buffed to a high shine. Before applying Iron Paste, make sure the surface is clean and free from rust using Rust Remover. Apply Iron Paste sparingly to the whole surface with a brush or cotton cloth. Allow to dry for a minimum of four hours before buffing with a brush or cotton cloth. To obtain a decorative, patinated finish on sculpted or high relief pieces, carefully polish the raised area with a cotton cloth. Always test the product on a spare surface or inconspicuous area for colour, compatibility and end result. Do not apply to hot surfaces. Re-apply and buff as necessary. Clean brushes in white spirit. Always wear rubber gloves when using this product.